Written by Janet Choi on February 25, 2016 . Acquisition: People become aware of you and give you their email address to become users or subscribers. Activation: People experience the aha! moment(s) necessary to grasp your value and hook them. Retention: Users keep coming back. Referral: Happy users and customers refer friends to try the product. Revenue: People become paid customers, upgrade to larger plans, and give you their moneys. A regular newsletter is one of the best ways for people to get to know you. The rhythm of newsletter emails trigger the familiarity principle, which states that the more people are exposed to something, the more they tend to prefer it (like that new song you hated the first time you heard it but now find yourself humming after a few more listens). That doesn’t mean you can just churn out a generic email once a week. These emails are extensions of your business, which means that like any good product, they should provide value to people and express who you are as a brand. So the trick is harnessing the effect of familiarity and exposure with regularly-delivered relevant information. Customize your newsletters or product welcome emails from the start to create positive familiarity and increase your reader’s inclinations to give your product a try. When you sign up for the newsletter from Kissmetrics, which offers marketing analytics for SaaS companies, you get to choose your own adventure with an “email forking” campaign that tailors subsequent emails. Click for full email Welcome emails have some of the highest open rates. 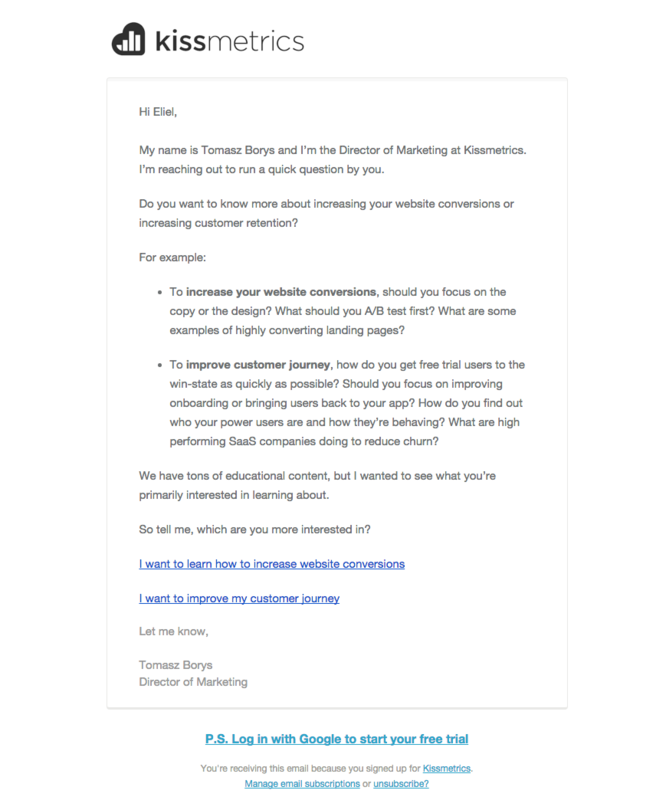 At this moment of heightened interest, Kissmetrics asks what you’re interested in and empowers you to choose a personalized email experience (which they’ve likely set out based on their internal buyer personas). Offering that fork not only makes it more likely that readers will receive emails they find valuable, they’ve had a hand in choosing their own fate, which can increase motivation to open and read future messages. Kissmetrics understands that people have different goals, and that a marketer’s job is to help people reach those goals. If your emails are just “showing up” in people’s inboxes, they’re going to end up archived, deleted, or even spammed. When your business feels like a familiar presence that consistently delivers value, it shows you care, builds trust, and helps convince them that you understand their pain points and how to solve them. Between the time of sign up and aha! moments, email updates can provide vital evidence of your product’s value. New users aren’t in the habit of using your app or service yet, and that means their relationship with you is still tenuous. Any friction point, including forgetting about you, could end it. Appeal to a users’ self-efficacy, or belief in their own ability to perform tasks and reach their goals. If people are convinced that they can meet their goals by spending more time with your product, they’ll keep making progress towards activation and beyond. Account activity notifications, for example, appeal to self-efficacy in two ways. First, even when people aren’t using your app, emails can remind them how your service is working for them. Second, if they haven’t completed important steps in the process, the email can show users that it’s easy to set up certain features or tasks to reach their goals. Like any social product, LinkedIn, the professional network, runs on user content. In their case, they’d like you to build detailed profiles. When you have a substantive profile, you can increase interest, connections, and the likelihood of finding jobs and other professional opportunities. With an empty or sparse profile, you’re probably missing out on key benefits. Value or no value — most people simply won’t fill out their profiles upon signing up, because there’s so much work involved in doing so. That’s why LinkedIn reminds users of that value every so often with a notification email when their profile gets viewed. 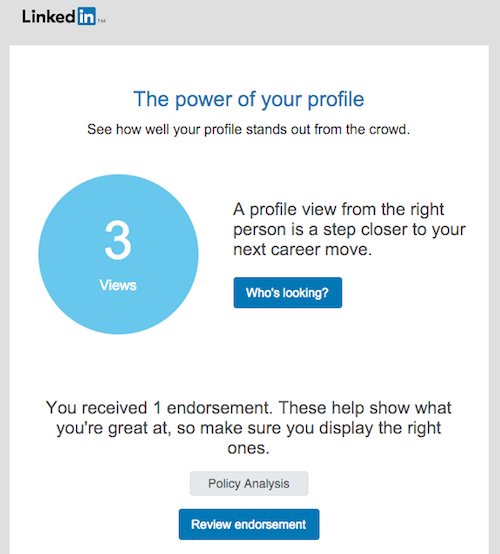 If you don’t have LinkedIn open all the time, you gain some feedback about how your profile is working — along with easy next steps towards activation — in this case, making sure you add and curate your endorsements. Keep in mind that notification emails can backfire if the information in them isn’t helpful or impactful, as Facebook’s growth team learned. These messages should help users realize the core values of a product. It’s not a good sign when people stop using your app or service, but don’t quit on them so quickly either. While it might be counterintuitive to call attention to a cancellation, there’s an interesting psychological phenomenon called loss aversion where people find it more painful to lose something than to gain something. Two keys to note here: for loss aversion to kick in, people need to have felt a sense of ownership first and the loss tends to be felt around benefits, rather than attributes. If you can reach out and remind people of the benefits they’re letting go of, summoning that initial motivation of why they tried and enjoyed your product in the first place — you can inspire them to come back. If you’re tracking your user cohorts to see when people stop using your product, you can figure out how long you have before they drop out altogether. Send people showing signs of inactivity an email before that moment to remind them what they’re missing — instead of saying that you miss them. 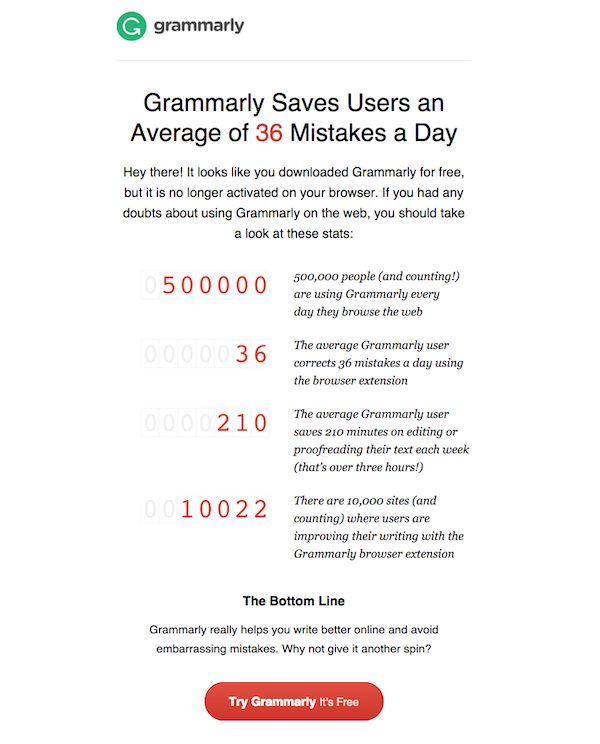 Grammarly is a free browser extension that provides accurate grammar and spell checking online. But if people turn off their extension, it’s not going to be long before they forget about it or uninstall it and churn out completely. So when Grammarly notices that the extension has been deactivated, they trigger an email. 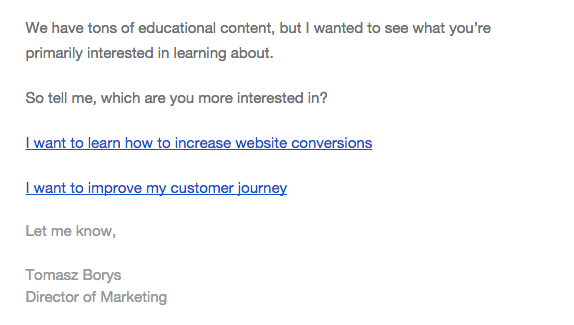 Grammarly’s email doesn’t dictate to people that they’re losing out. They hit you with persuasive proof and numbers. It’s a strong combination punch of social proof (500,000+ people! ), desire not to waste time (over 3 hours! ), and fear of mistakes (36 a day!) to make you feel like there’s more than just a random browser extension at stake. If all those stats are convincing, Grammarly makes it easy to reactivate and get back on the grammar horse with a prominent red call-to-action. Word of mouth is one of the most persuasive marketing means out there. Yet it’s often the case that we forget to actually ask people for referrals. Your referral program could simply consist of well-timed, targeted emails with your request, tapping directly into the intrinsic motivation happy customers feel to help spread the word and help their friends. Or maybe there’s an incentive, depending on the nature of your business or product. You might be familiar with Dropbox’s famously successful refer-a-friend program, which increased signups by 60%. They offered the referrer and referee extra storage space, framing the incentives and call-to-actions around their core value — a triple-win for all parties. While it may feel like a tightrope walk to get the tone and pitch of referral emails to feel right and not spammy, the goals are straightforward: ask nicely, at an opportune time, and clear the path for the referral to happen. If something is easy to do, it’s more likely to be done. 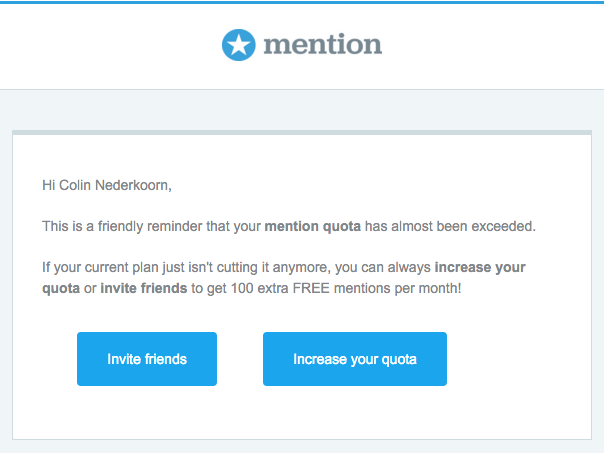 Mention, the social monitoring tool, takes an interesting approach to referral emails. Like Dropbox, they offer an incentive around their core value — the number of mentions that you can access. What’s smart about their approach is their timing. Mention triggers an email when you’re about to exceed the mention quota allotted to your plan as well as right after you’ve exceeded it. The opportunity is ripe here. If someone’s coming close to going over their limit, that means their usage is high and they’re probably pretty happy with your product. It’s a perfect time to ask if they need to increase their limit, and here, Mention offers two paths forward — upgrade and pay more or invite friends to get a quota boost. Combining referral and revenue here works because the message is well-timed to consider the state of the user. To grow a business, there’s the cold fact of having to turn users into paying customers and get paying customers to upgrade. You might have identified and created features that your customers will love so much they’ll upgrade, but people aren’t necessarily spending time looking at your pricing page or paying attention to in-app feature announcements. That’s why every new feature you release should be accompanied by personalized new feature updates that target the specific customers who have expressed interest in that feature. Getting a personalized email with a clear path to upgrading will remind users you paid attention to their request and want to improve their experience with your product. StatusPage, the server status communication platform, approached their feature roadmap with their revenue stage in perspective, designing a process that culminates in a perfectly timed, personal email campaign. Their engineering team didn’t just build random features and pray that customers liked them. They began by keeping close track of what customers actually wanted. For every major request, they recorded the number of people who expressed interest in it, the price tier the feature would live in, and the additional MRR expected from implementation. When enough users requested a feature that aligned with their business goals, the team prioritized building the feature and made it happen. Then, when the feature rolled out, StatusPage sent personalized emails to the customers who’d made the request. sample email The email also encouraged people to upgrade. There’s not much more of a prime opportunity to suggest an upgrade upon delivery of super-relevant, valued improvements that you already know specific customers want. It worked: that strategy resulted in increasing ARPU by 2.4x. To date, they’ve had over 4x as many upgrades as downgrades and over a fifth of all their users have upgraded from a lower to a higher-tier plan. Designing relevant emails to feel personal and well-timed, even as they go out to a multitude of people, is a worthy challenge and an iterative process that’s going to take time and effort to get right. But tying your emails to a clear framework will provide structure, guidance, and alignment with how your business goals. It’s a smart way to work. Remember though, that people don’t live out their days in your pirate metrics funnel. They don’t care what stage you categorize them in — they care whether you’re addressing their needs. As Samuel Hulick points out, it’s much healthier to focus on how you can “help further the customer’s relationship with their greater need.” The pirate model helps map your planning and process, but if you get it right, your customers won’t feel like they’re getting shoved around in your various stages and funnels. Your emails will play a part in furthering people’s goals, while you can make progress building relationships and your business. 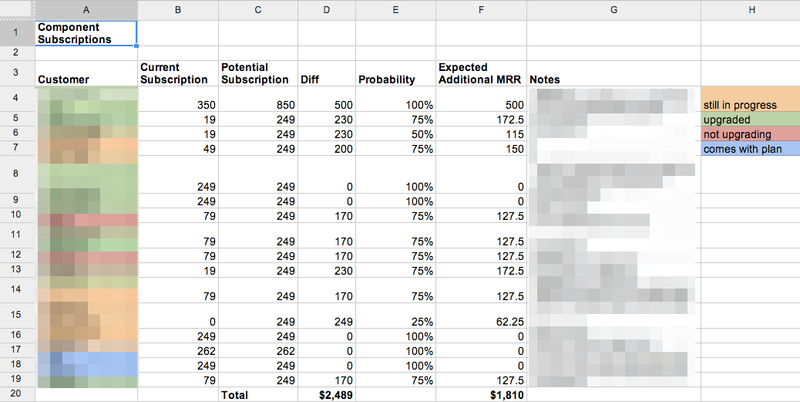 Do you plan your email campaigns around pirate metrics? Share your experience with us in the comments! 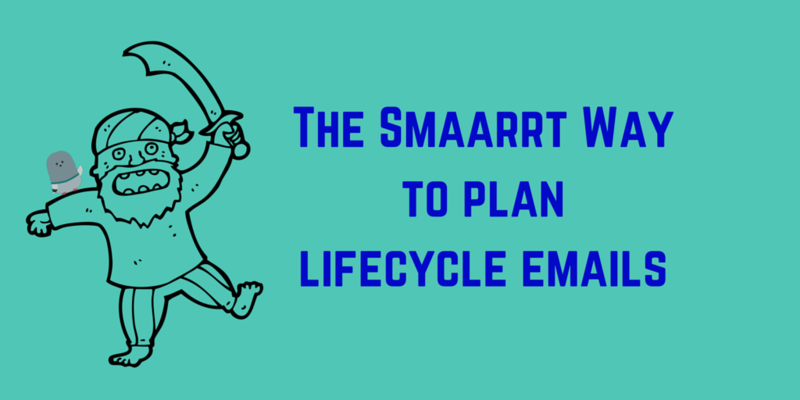 We’re cooking up a whole ebook on how to plan and create powerful lifecycle emails! 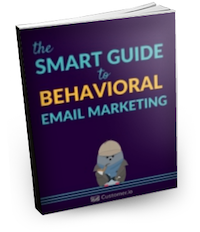 Learn how to build your email-based growth machine.